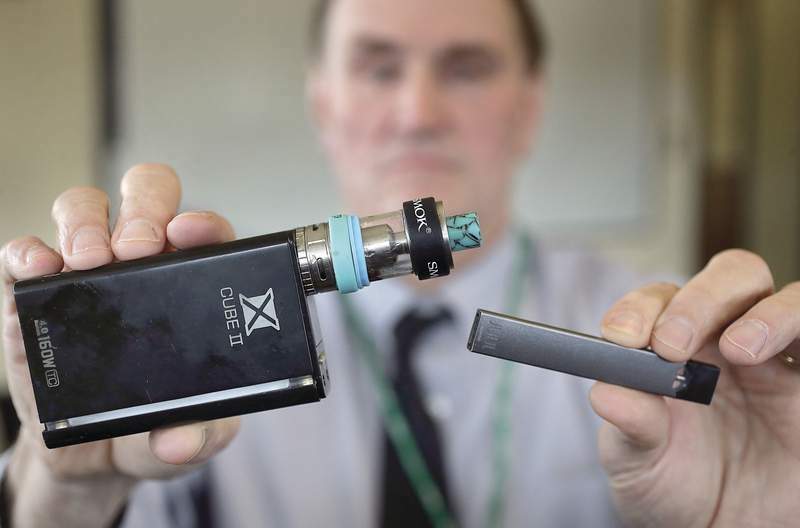 Nancy Cripe is glad the Food and Drug Administration is cracking down on manufacturers of electronic cigarette products, but she doesn't hold out much hope the companies will stop targeting teenagers in their marketing efforts. “How is the industry going to wiggle out of this? – that's what I'm thinking,” said the executive director of Tobacco Free Allen County. The FDA announced Wednesday it will give Juul Labs and other manufacturers 60 days to prove they can keep their e-cigarettes out of the hands of teenagers. The federal agency also warned retailers of stepped-up enforcement of the ban on the sale of vaping devices to anyone younger than 18, and issued 131 fines for violations. But Cripe said the crackdown on manufacturers will be difficult to enforce. If the FDA truly wanted to target teen use, it would have required the manufacturers to stop producing flavored vapors, because that's the attraction for teenagers, Cripe said. And while the nearly $50 cost for an e-cigarette starter pack might look intimidating to young buyers, the product is heavily discounted, with ample coupon offers and first-time buyer incentives. There's plenty of evidence high school students are attracted to them. The Indiana Youth Survey, conducted by the Indiana Prevention Resource Center, found nearly a quarter of Indiana high school seniors said they used e-cigarettes in 2015, higher than the 17.1 percent national rate for12th graders. Since then, the percentage of Indiana high school seniors using e-cigarettes has declined to 19.7 percent. The American Academy of Pediatrics warns that “juuling,” as it is known by teens, is highly addictive, and its popularity is booming. CNBC reported in July that Juul's sales increased 882 percent in a single four-week period earlier this year, with its share of the e-cigarette market topping 70 percent. Some research has shown teens believe they are inhaling only water vapor, not nicotine, when they use Juul and other devices. Teachers report students are using the devices in classrooms, hallways andrestrooms. They share them with classmates. Teens who use e-cigarettes are more likely to begin smoking tobacco cigarettes, according to federal studies. In Indiana, where the prevalence of adult smoking already exceeds the national average, we can't afford to support another generation of smokers and their related health costs. The FDA crackdown is good news, but Tobacco Free Allen County's call for an end to flavored e-cigarettes seems like an even better course.